Well actually I haven’t been framed but my embroidery has. These finishes have been waiting in the wings for a while but I finally got around to ordering the frames and getting them on the wall this week. First up, the Narrow Boat from Bothy Threads. I chose the same oak frame as I have for all of my finished pieces but this time I decided on a blue mount. 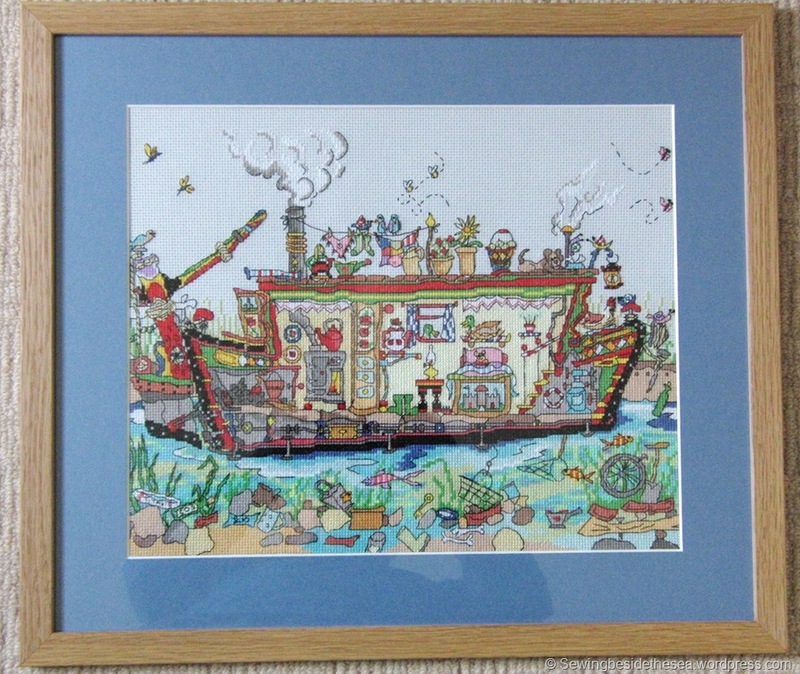 If you want to see more photos of this work in progress, just search for “narrow boat” on this blog. I thoroughly enjoyed stitching it . 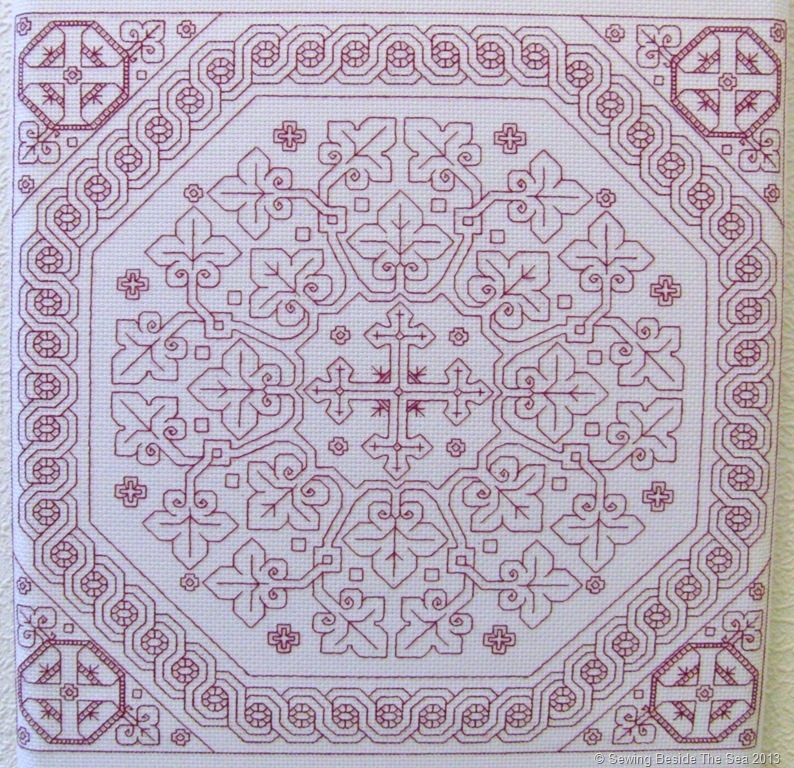 Next up is Pentecost 2 which was a free chart available on the Practical Blackwork web site. 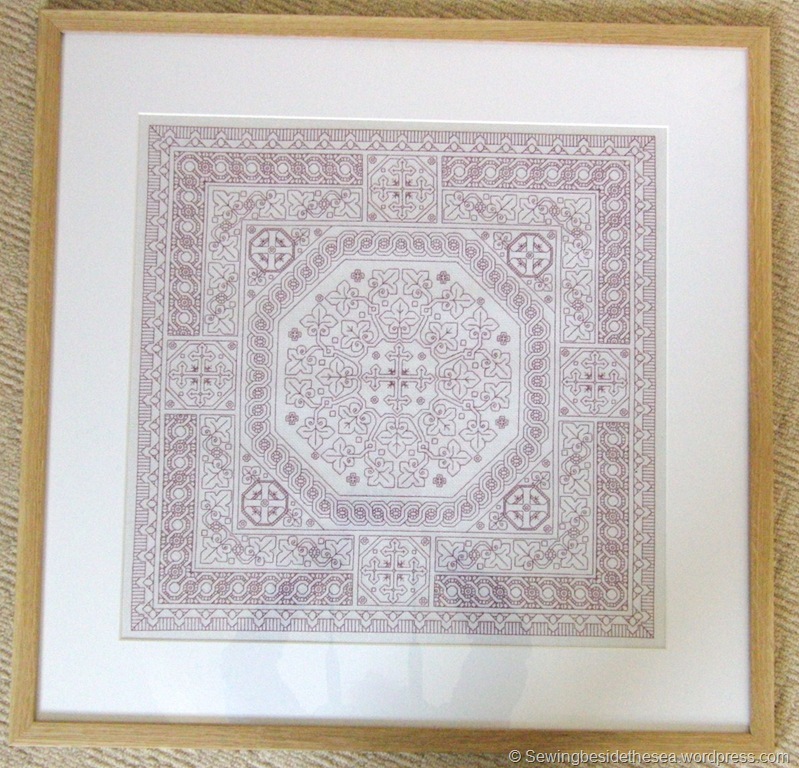 Look in my blackwork category if you want to watch this one grow. It is incredibly generous of Liadain to share her work. I stitched along with my friend Claire on this project. You can find her lovely blog by clicking here. It’s nice to finally have them both on the wall. I hope you will also have time to finish a project this weekend . No doubt, if you celebrate Christmas, you will be knee deep in preparations for the big day. I managed to get a few hours to sew yesterday so the penultimate stage of Pentecost 2 is now complete. There is only the final border left to do. We are getting there…. Here is as much as I can see on my frame at the moment. If you would like to see it opened out, Claire my stitching buddy, is displaying her version here. We hope to finish this piece sometime early next year so watch this space. 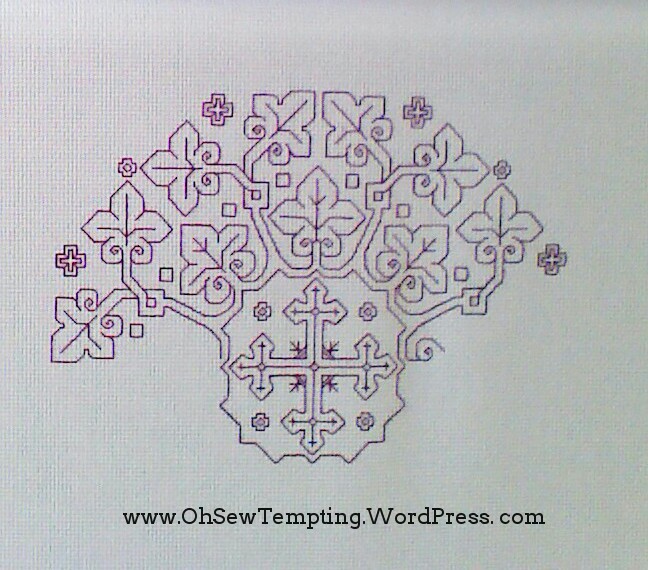 If you’d like to stitch this design yourself, hop over to Practical Blackwork where you can download the chart for free. 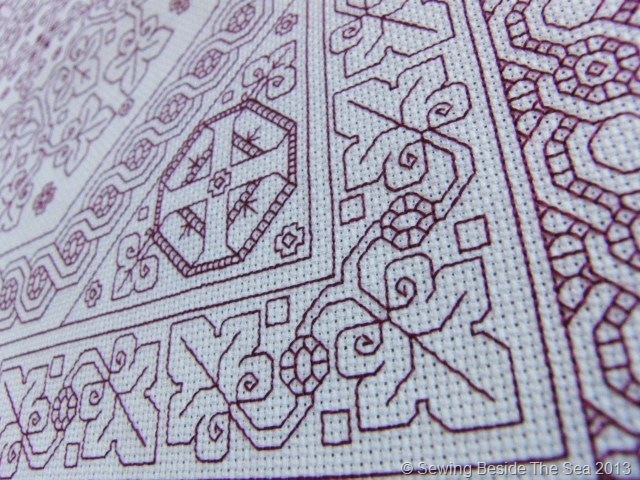 An Update on the blackwork! Hi everyone, I hope you are all well and that you have had much more time to craft than me recently. It his been a bit busy here Beside the Sea but I have been chivvied along by Claire to finish our next agreed stage of the Pentecost 2 blackwork. Mine is still on the frame so nobody, including me, has seen the full project yet. 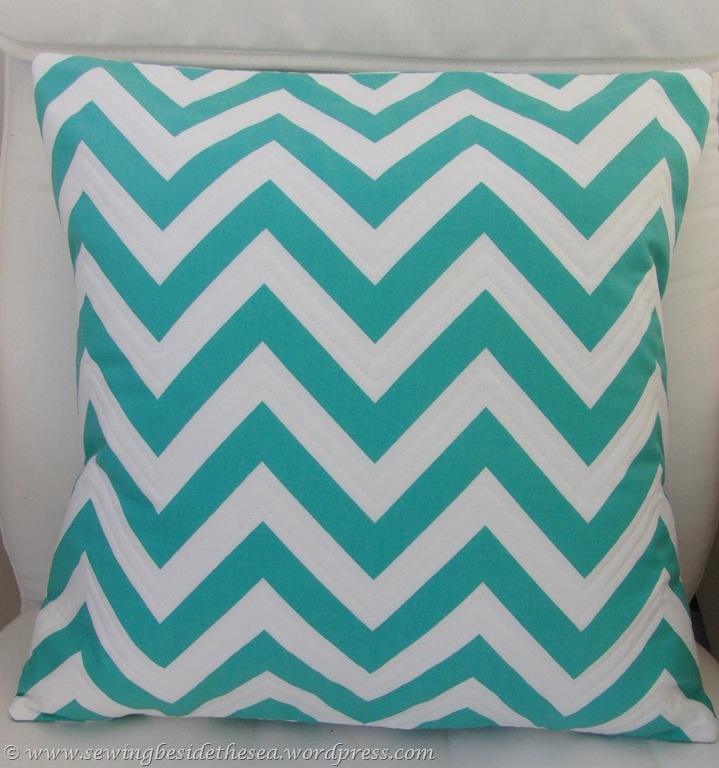 Pop over to Claire’s blog to see her version of this beautiful design. 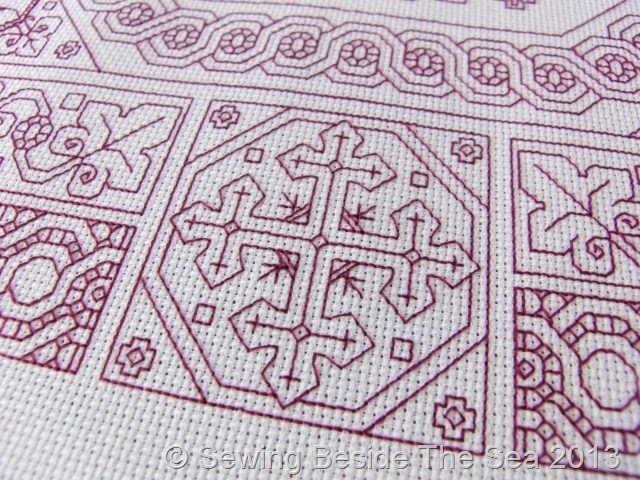 She hasn’t stitched on a frame so you can even get a sneaky peek of the whole design so far. 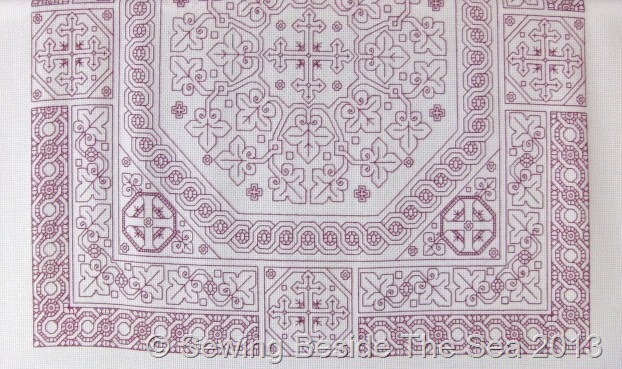 You can find the free chart at Practical Blackwork. How generous is that? We independently made changes to the latest stage because there were some errors in the chart. I’m not surprised at all about this because it is so detailed. This means we have unique versions as we both decided to stitch this border in different ways. It appears we are probably the only two people on the planet who are mad enough to tackle a project of this size. 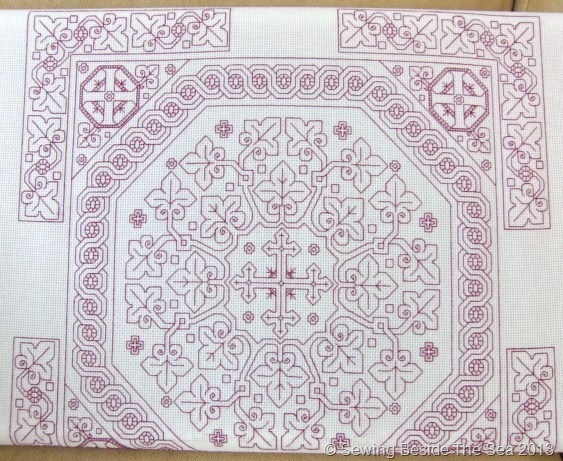 We believe the person who charted the design, based on an altar cloth, hasn’t stitched it herself yet LOL. I know she will enjoy it very much when she does. So that’s it from me for now. I’ll be back as soon as I can! 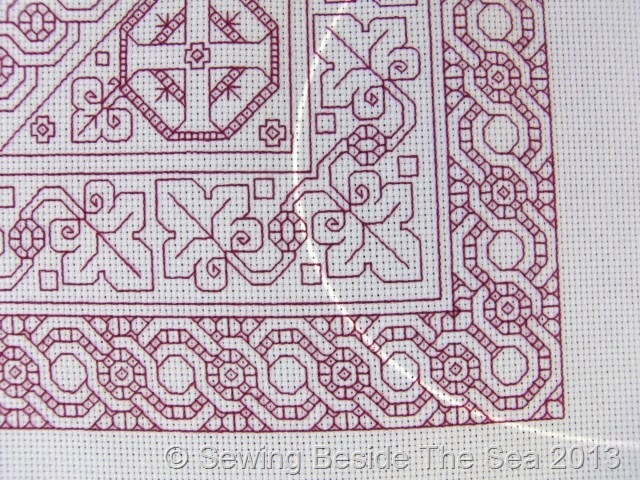 I’d like to show you some progress on Pentecost 2, a blackwork design charted by Liadain at Practical blackwork. Clicking the link will take you to Liadain’s blog where she explains the inspiration behind the design. It is so generous of her to share the chart with us. As you know, I’m stitching along with Claire. We are up to the same part of the stitching and you can see her gorgeous progress here. I’m really pleased to be stitching along with someone who keeps up a reasonable pace, even though I’m the one who is always playing catch-up, sorry Claire! As you can see, it is no longer possible to show you the full extent of my progress due to having the fabric attached to my scrolling frame. I won’t be removing it until all the stitching is complete. So we’ll all have to wait for the big reveal, including me. Just popping in to share my progress on the blackwork that I’m stitching along with Claire. 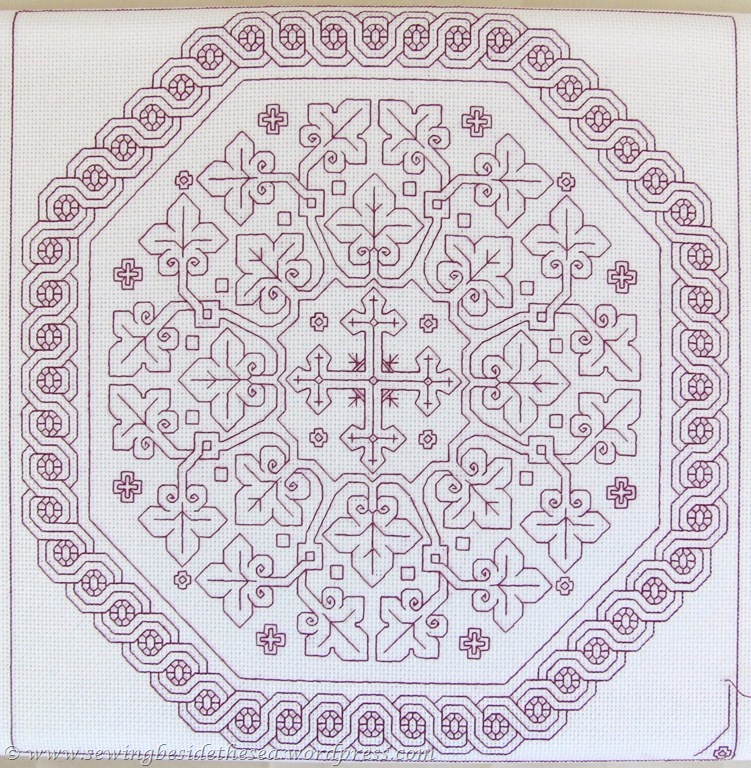 Click here to visit her blog and see her gorgeous version of the same design. Judging by the overall area that we have stitched so far, I reckon we have just about one third finished. 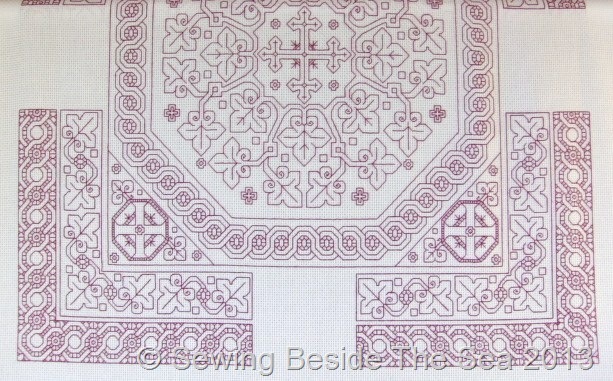 However, the next borders look very stitch intensive so we’ll still be sewing for quite some time yet. Will we finish before 2014, I wonder? The free chart for this design is available here. The web site http://www.practicalblackwork.com is well worth a visit for inspiration. This is the last time I will be able to show you the design in full. From now on, the embroidery will be wound further around my frame. You’ll have to wait until the end when I take it off the frame and so will I . However, I’ll continue to post regular progress updates. It’s such a joy to stitch. Hi everyone! Happy sunny weekend from Beside the Sea. 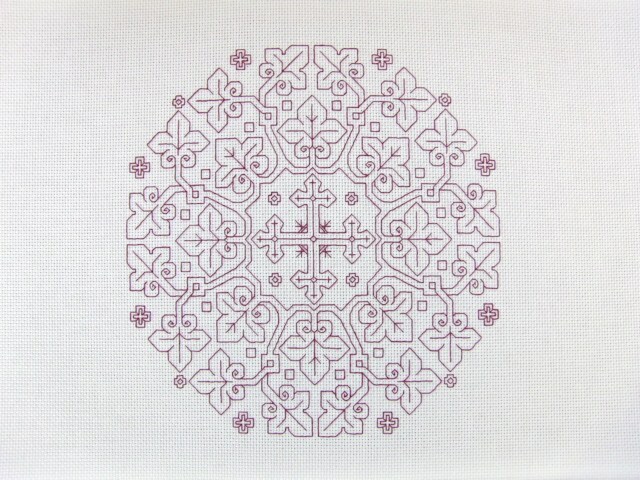 I’ve had a lovely time stitching more of Pentecost 2 from http://www.practicalblackwork.com. You will remember that I am sewing along with Claire over at Claire93. We agreed to finish the swirls before posting an update so here is my stitching so far. I’m just beginning to stitch the bottom right corner so there’s a tiny clue as to what is coming next. If you want to see the complete design click here and scroll down. Claire has chosen to add an extra dash of colour and it looks really lovely. You can see her version here. We have found a few errors in the chart so the emails have been flying back and forth across the sea to enable us to decide how we are going to stitch certain parts of the design. It’s lovely to have a stitching buddy to help keep me on course and motivated to finish this large project . 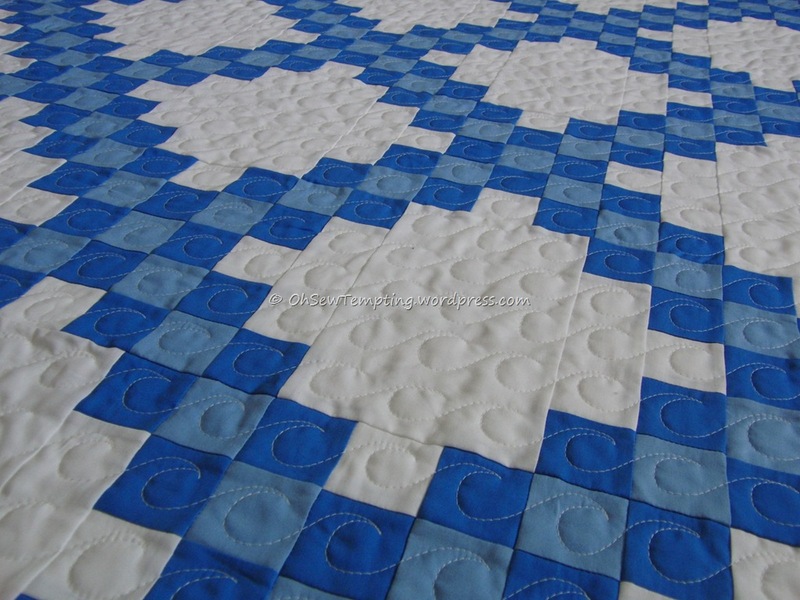 Just in case you haven’t already seen it, I also have another quilting finish to share with you from my other blog Oh Sew Tempting. Later today, I’ll be finishing a cardigan which my Mum has started to knit. She doesn’t enjoy stitching up or knitting the neck and button bands so she has passed it on to me…..not that I like doing those bits either . Time to give a “Shout out” for my daughter who has decided to restart her photography blog. It’s all far too technical for me but I’ve included a button on the right if you’d like to see what she is up to with her new toys. Have fun with your crafty projects this week! My stitching buddy Claire is itching to get stitching on the next part of the blackwork design we are sewing together which you can see by clicking here (scroll about half way down the post). I’m supposed to have the surrounding straight-sided octagon done by now but I’m showing you what it looks like so far. 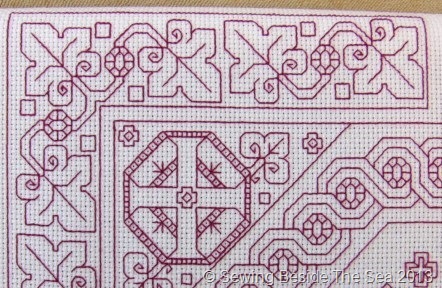 You can see Claire’s stitching by clicking here. She’s done a fabulous job and we have been discussing whether or not she will choose to add a second colour. All will be revealed soon. 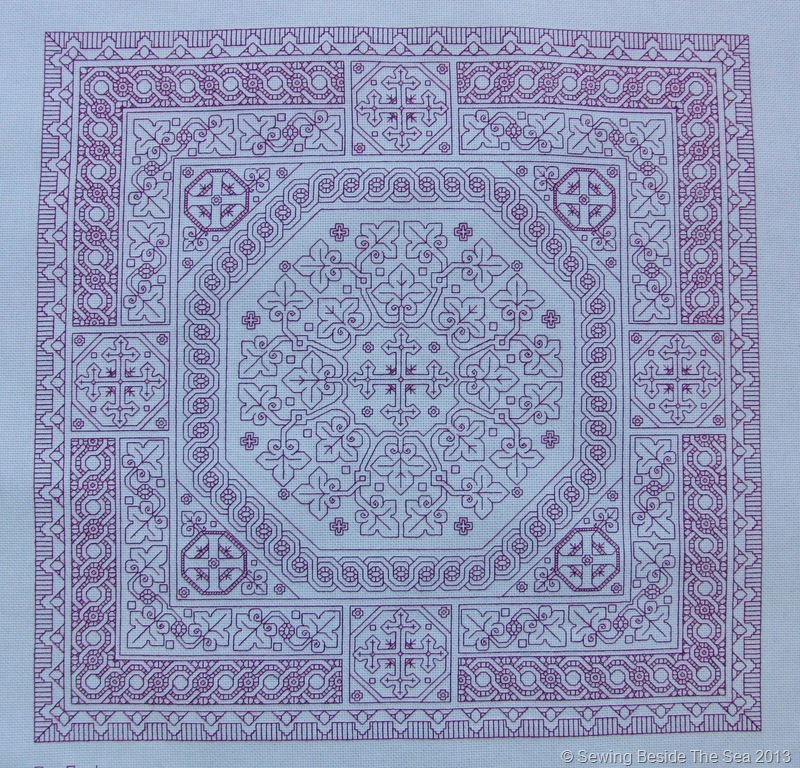 The chart is available at http://www.practicalblackwork.com. Here’s a quick update on my work in progress. I eventually chose to sew with DMC embroidery floss number 1029 and I’m happy with the outcome so far. If you want to see what I’m making, just scroll down to my previous post. 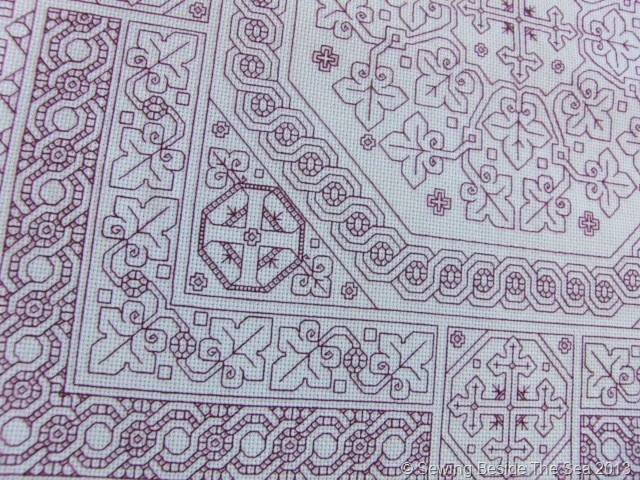 if you want to stitch this one, you can find it here http://www.practicalblackwork.com.